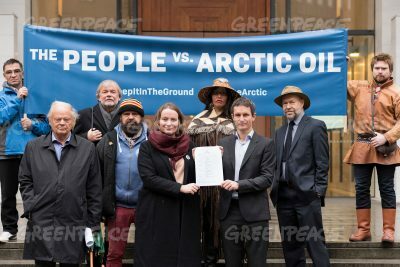 Greenpeace Nordic and the environmental organization Natur og Ungdom (Nature and Youth) are the official plaintiffs in a lawsuit they contend is supported by scientists, indigenous leaders, activists and public figures. A group of around 200 Norwegian authors, academic experts and other celebrities warned last year that they would sue if the government failed to halt the latest licensing rounds for further oil and gas exploration in the Barents Sea. Among them was author Jostein Gaarder, who was among those photographed in the plaintiff group on Tuesday. The licensing round has since been announced, amidst both praise and harsh criticism. Prime Minister Erna Solberg of the Conservative Party has been blasted for her devotion to oil, while Oil & Energy Minister Tord Lien has been repeatedly challenged over his opening of new Arctic oil fields amidst worldwide commitments to cut carbon emissions. Another challenge to the government’s bullish approach to oil, which has made Norway affluent and supports its welfare state, emerged this week when the leader of one of Norway’s major trade union federations spoke out against oil exploration off Lofoten, Vesterålen and Senja and called for cuts in production from existing fields. The call from Fellesforbundet’s leader Mette Nord marks a sharp deviation from other labour organizations’ support for oil exploration and production, because of the jobs it creates. Among oil companies with new licenses in the Barents Sea are Norway’s own Statoil, Lukoil of Russia, Chevron and ConocoPhillips of the US, DEA of Germany, Idemitsu of Japan, Aker BP of Norway, Capricorn and Centrica of the UK, Lundin Petroleum of Sweden, OMV of Austria PGNiG of Norway and Poland and Tullow of the UK.